My oldest son Clayton made this for an art project last year. I love that God's MERCIES are new every single morning. I thank God for each new day and each breath that he has given me. A moment doesn't go by that I don't stop and thank him for something. for good health, for friends, for food to eat, for shelter and so on..... The list is endless! Giving God Praise and Honor and Glory today! Hi Amy, I just love the new and fresh Spring design you have chosen! What a sweet post! I always so enjoy seeing your updates. Blog On! Amen, He' so good to us! BTW, love your blog. What a great creation Clayton made. 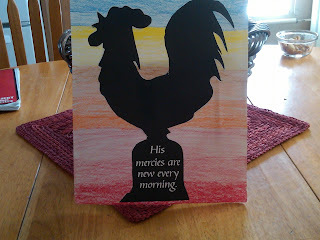 I love the scripture along with the Rooster... perfect combo... Rooster is bringing in the morning isn't he? I am so thankful that His Mercies are new every morning, and it is great to remember it; we have an opportunity to start over every day... wow. I am thankful for His peace, and His joy, and His provision, our children and grandchildren, our marriage, our cozy Home... and for you. Have a great week Amy.